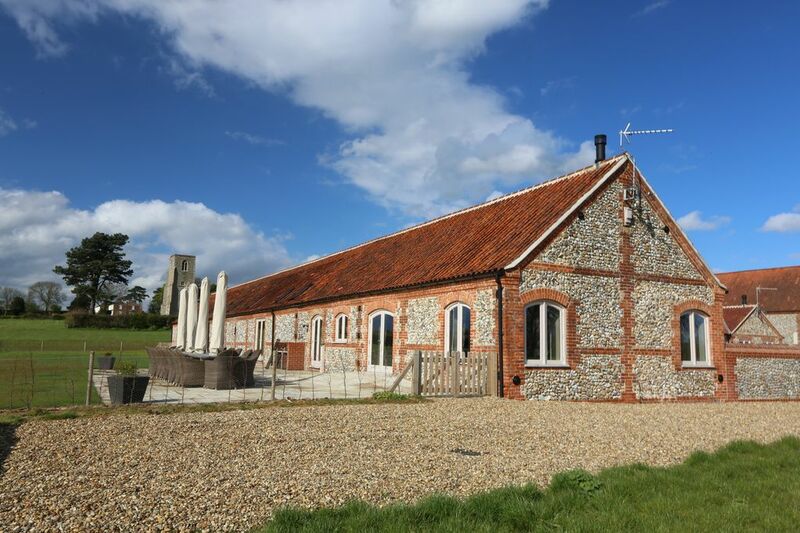 Brazenhall Barn is traditional 19th century Norfolk barn converted into something special! The large, open-plan kitchen/dining room (which can seat 22) leads into a stunning living room with open fire and enormous TV. Free WiFi. The kitchen is equipped with gas hobs, double oven, two washing machines, wine cooler and microwave. We have concentrated on creating an amazing atmosphere in the Barn and there is an excellent lighting system designed to create a relaxed atmosphere. There is a special 'TV / childrens room' for those who want to watch TV whilst the rest of the party is in the main living area. The bedrooms are all en suite with bath and shower or shower and, again, there is lovely lighting throughout and a sense of comfort and elegance. Outside, the large patio dining table can also accommodate 22 in comfortable wicker-style chairs (with cushions!) and there is a very large BBQ. Awarded Five Stars and a Gold Award every year since 2010, Brazenhall Barn is a luxury barn conversion with great facilities. The Barn sleeps 14 and the Lodge Sleeps 6 with the option of two temporary beds but there is space for dining both inside and out for 22 - The Barn can be hired with the Lodge for larger parties. The Barn has 7 bedrooms and the Lodge 3. Int the barn, there is an additional TV/Children's room. The whole property is surrounded by summer meadows which are yours to use during your stay. We offer a catering service for formal dinners or for food on arrival which can be waiting for you in fridge. There is free WiFi throughout, so keeping in touch and finding out what the local area has to offer couldn’t be easier. Indeed you can do some online shopping from the local supermarket (and yes, they deliver!) or book yourselves into one of the many local attractions. Brazenhall Barns: These are owned and operated by Peter Allingham. Peter has been in the holiday business since 1994, running the high-end specialist operator, Ancient World Tours. Peter's family has farmed the surrounding area of Norfolk for well over a hundred years and Brazenhall Barns are luxury holiday homes converted from ancient livestock yards - yards which were mentioned in 18th century French travel journals as being of exceptional quality! Brazenhall Barns is redecorated top to bottom two years so the Barns always looks 'just opened'! I grew up in this part of Norfolk and for me it is one of the most beautiful parts of the UK with gentle rolling hills (Norfolk isn't as flat as they say! ), delightful villages, bags of history and plenty for younger visitors to do. We have some unusual features at Brazenhall Barns. Not only can we accommodate 14 in the Barn and 6 in permanent beds in the Lodge but we can have up to 22 people dining inside our outside the Barn. This makes both properties ideal for hire if you are looking for a family reunion or special birthday party. The Barns are surrounded on three sides by lovely summer meadows and these are yours to enjoy during your stay. We're also next to the Archangel Distillery - Gin tours are available! Large patio with outside dining table and chairs for up to 22 people. Notes on accommodation: All twin rooms can be converted to doubles via the ‘zip and link’ system. All rooms are en suite with bath or shower. There is a large garden and beautiful patio. The kitchens have been created to a very high standard with wine cooler, American fridge and superb ovens and gas hobs. The buildings are heated throughout with state of the art ‘ground source’ under floor heating as well as stylish open designer gas fires. The Barn can be hired with the Lodge to provide a great holiday location for a party of up to 22 people, perfect for reunions and family occasions. Facilities include two dishwashers, wine cooler, washing machine, tumble drier, double oven i-Pod compatible music system and TV's in every room. Outside: The Barn Garden is large and grassed with a beech hedge running round it. The large patio has outdoor dinning for 22 with a large barbeque. The Lodge Garden is walled and, again, has patio and barbeque with outside dining for 8. Spacious, peaceful barns, perfect for a family gathering. If you are looking for large accommodation with beautiful outside space and views to celebrate a family birthday or special occasion, you could do no better than booking Brazenhall barns. By far the most comfortable nights sleep we have all had in a holiday accommodation with lovely touches such as their own toiletries (which smelt amazing) and great tasting gin. Being all on one level was perfect for those in the party with limited mobility and meant no steps for the little ones to fall down too. Our group was 14 strong, aged 1-70 and we all had the most amazing stay, helped by the glorious Easter bank holiday weather. Peter and Erica were both helpful and informative and Erica very kindly provided lots of good family friendly places for us to visit beforehand. I would happily recommend Brazenhall barns and the party have all said they would love to return again! Had a wonderful stay at the Barns. Comfortable, well laid out and a fun time for all of us! Our group of 12 stayed (and dog) and had the best time. There is so much to see in the area and some great restaurants too. We enjoyed the massive dining table and spent too much time sitting at it sipping wine. The view of the church from the garden in the evening sunlight was amazing. Norfolk is just the best place for our annual get together and we will definitely be back! I'm so thrilled you had a good time - we loved having you to stay! We're so lucky to be living in this part of the world. When I drive to the Barns in the morning and, at this time of year, see the sun come up, I really count my blessings! Look forward to seeing you again next year and keep an eye on our newsletter - we'll let you know of any Food and Drink festivals in the area we think you'll enjoy! We had a great time this week (our third visit) and it was so good to be back. The Barns are beautiful and so comfortable and well equipped. Great value out of season too. We'll be back! Thank you! A group of 13 of us had an amazing weekend at Brazenhall Barns. The house is all on one level with no steps - a great help for my uncle who finds it hard to do stairs. The bedrooms were so comfy I've even taken a note of the mattress make so I can get one at home! The kitchen was very well equiped and it was great to have such a huge dining table for us all to get around in the evenings. There was lots to see close by and there are so many gastro-pubs and restaurants all along the coast that we were spoilt for choice. We will DEFINITELY be back! A Birthday weekend with the WOW Factor! We’ve just returned from our weekend at Brazenhall Barns. We loved it. We really couldn’t have asked for or found a more perfect venue for my husband’s Birthday celebration. Thank You. Sally came on Saturday night with her team and the meal she prepared for us was terrific, please tell her how much we appreciated her efforts and the great BD cake. On top of a great place to have a family party, Phil Barnes came to take photos also a recommendation from the website. The weather could not have been better – A terrific weekend – we had lots and lots of fun and probably too much food and drink. Thank you so much for your kind words. We look forward to welcoming you back! The Archangel Distillery is in the same hamlet and tours can be arranged by contacting them in advance. Just a couple of miles away is the ‘Extreme Adventure Company’ with treetop swings, walks, a 3G swing and its famous 1000 foot zip wire! There is a small course too for more junior members of your party. The stunning Pensthorpe Park is just past Fakenham and is well known as the host of BBC Springwatch as well as being voted Norfolk’s Best Visitor Attraction. Children (of all ages!) love steam engines – and the delightful Wells and Walsingham light railway offers a charming way to spend an afternoon. Operating between April and the end of October, this narrow-gauge railway (the longest of its type in the world) passes through some great countryside on its half hour journey to and from the coastal town of Wells with its quay and excellent sea food. We’re minutes from Fakenham where are there are two large supermarkets, a cinema (for the odd rainy day), bowling alley and sports hall and plenty of smaller shops to keep you interested. Close by are two of Norfolk’s most popular shopping towns which are packed with lovely small shops, restaurants and pubs. These are Holt and Burnham Market – bywords themselves for lazy sunny days pottering around antique shops before settling down to an exceptional lunch. There are plenty of excellent pubs and restaurants in the area and these are shown below. We can do no better than quote directly from their website. Our local taxi firm, Tiny's Taxis (01328 856 314) are very happy to provide an excellent service to and from the restaurant of your choice if none of you fancies driving. Changeover Day: Most changeovers are on Fridays or Monday but we can be flexible by arrangement. If the property is not occupied the day before arrival then we will nearly always allow an extra day (usually a Thursday) without charge.